Coresight Research says that so far in 2019, announced retail location closures are at 5,846 stores. 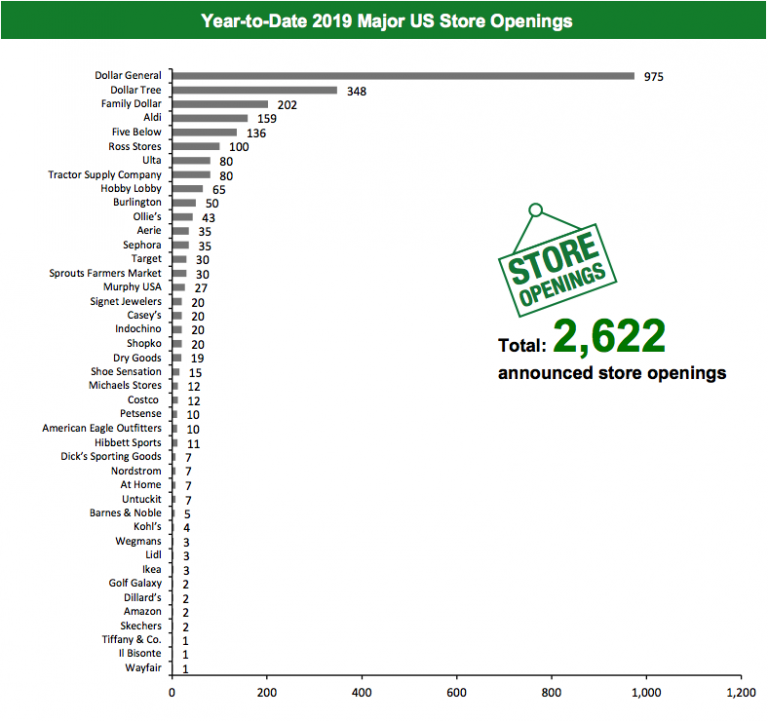 The number of announced store openings in 2019, on the other hand, are 2,622 stores. 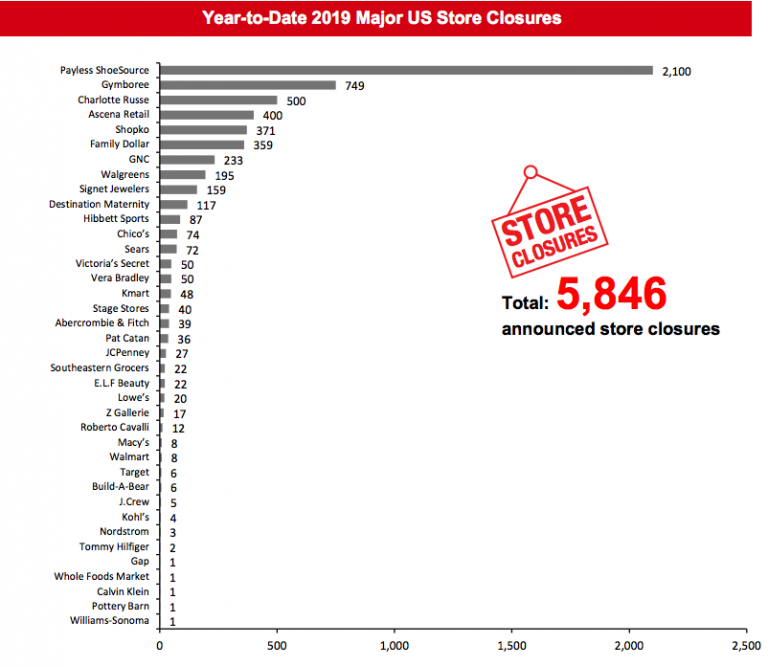 The stunning thing about the 2019 announced closures is that for all of 2018, total retail closures were 5,854 stores…while openings were 3,239. This means that almost as many retail locations have disappeared in the first quarter of this year as closed in all of 2018. Ironically, the rate of closures was said to have stabilized somewhat in 2018, so this analysis suggests the trend may be picking up once again. Coresight Research covers all forms of retail including hard goods such as consumer electronics. CR’s report noted that the top companies announcing closings and/or bankruptcies included: Payless ShoeSource, Gymboree, Charlotte Russe, Ascena Retail, and Shopko. Conversely, top companies opening the most locations include: Dollar General, Dollar Tree, Family Dollar, Aldi, and Five Below. Five Below – The company opened 125 stores in 2018 and their pace appears to be picking up in 2019 with a planned 145-150 openings. 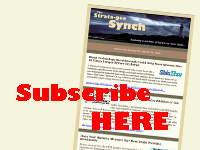 If they achieve their plan, they will have a total of 895-900 stores in the US. The company says it plans to ultimately open a total of 2,500 locations. Walgreens – The major drugstore chain had previously announced plans to close 600 locations. However, this year they increased that to a total of 750 closings. These closings are part of a rationalization in the wake of their acquisition of the RiteAid drugstore chain which gave them another 1,932 stores. Untuckit – A direct-to-consumer clothing chain who started online is expanding their physical footprint with seven new locations. This is in addition to their existing physical storefront count of 50 locations. CR notes that most digitally native retailers find that physical storefronts give their sales a lift and the opportunity for face-to-face customer contact. There are retailers on these lists who sell electronics, such as Sears, Target, and Amazon. But so far this year, no major electronics specialist has announced any closings or openings. However, in 2018 Best Buy appeared on the closing list (-275) and the opening list (+28). Finally, CR notes that there are additional announced retail closings by Saks Fifth Avenue (20), Williams-Sonoma (30), and the Gap (230), but these are not included in the above numbers as the companies have not made clear just exactly when these closings will take place. But if they do take place in 2019, we will blow the doors off last year’s results. Learn more about Coresight Research at: coresight.com.